When the noted East German director/cinematographer, Werner Bergmann, left the preview screening of Born in ‘45 (Jahrgang 45), he turned to Roland Gräf, the film’s cinematographer, and spat: “Eastern Bloc Italians!” He may have meant it as an insult, but Gräf took it as a compliment. 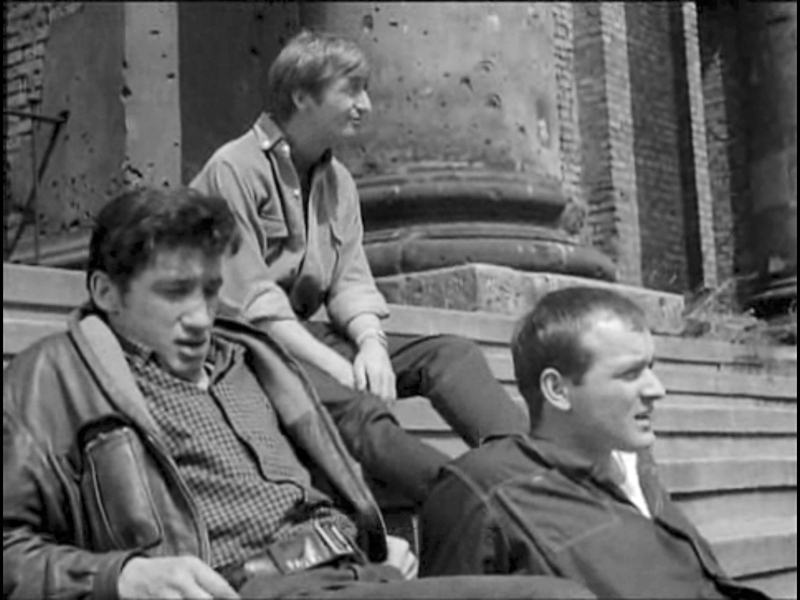 Born in ‘45 was a conscious attempt to duplicate the feel and appearance of the Italian neorealist films, which Roberto Rosselini once famously described as “the artistic form of the truth.” Director Jürgen Böttcher, and Gräf were happy to acknowledge this debt to the Italians in this film. Born in ‘45 is a desultory look at the life of Al, a young man who married too young, and is feeling like he’s missing something in life. His wife, Li, can feel him slipping away, but doesn’t know how to stop it. Al hangs around with his buddies, flirts with other women (successfully and unsuccessfully), works on his motorcycle, and argues with his co-workers about duties and responsibilities. As with its Italian counterparts, Born in ‘45 doesn’t bother with the rigid three act structure so beloved by Hollywood filmmakers. It has a beginning, middle and an end, but the characters come to no great revelations, nor does it feel like things will be change much after the filming stops. So ist das Leben. The action takes place in the Prenzlauer Berg district of Berlin. During the GDR years, Prenzlauer Berg wasn’t the hip neighborhood it is today. It was a run-down area that housed many young and working class families. The buildings were old and the district was popular with filmmakers such as Gerhard Klein and Jürgen Böttcher, who wanted to show the lives of ordinary people. The film is shot in black-and-white. Unlike film noir, which uses the same medium to show the struggle between good and evil by enhancing the contrast between light and shadows, Born in ‘45 is about all the grays that lie in-between. It is, perhaps, for this reason that the film was banned in the wake of the 11th Plenum. Unlike The Traces of Stones (Spur der Steine), or The Rabbit is Me (Das Kaninchen bin ich), it doesn’t deal with the corruption of officials, but it does show life as ultimately meaningless and more than a little depressing. For this reason, the film was deemed “indifferent and insignificant,” and was not publicly shown until after the wall came down. In documentary filmmaking, the relationship between the director and the cinematographer is crucial. The same is true here. Using new, lighter cameras that could be carried on a shoulder, and eschewing dramatic lighting , Roland Gräf gives the film the look and feel of a documentary. At times the line blurs. When a bus load of sightseers disembarks at Gendarmenmarkt, where a trio of characters from the movie are hanging out, the tourists seem genuinely surprised; as if they were not expecting to be in a film. Although scorned by some and banned by the authorities at the 11th Plenum, the film’s influence can be seen in many later productions. In the 1970s, Gräf moved from cinematography to directing. He continued making films after the wall fell, although much more sporadically. One of the films, Der Tangospieler (The Tango Player) had started filming before the wall came down, but wasn’t finished until two years later. The star of the film, Rolf Römer, had made a few films before Born in ‘45, but was relatively unknown. In 1966, he became a star when he co-starred with Gojko Mitic in The Sons of the Great Bear, the first East German western (Indianerfilm). He went on to co-star with Mitić in several of these so-called “Easterns,” usually playing the sole white man sympathetic to the plight of the Indians. In 1978, he wrote, directed, and starred in an episode of the popular East German police series Polizeiruf 110. The episode, Schuldig (Guilty), was seen by the authorities as an attack on them. Römer was blacklisted after that, and was not allowed to work in films in East Germany. Eventually he ended up in the west, where he worked on a few productions, but never had the fame and acceptance that he had acquired in the GDR.